For a long time, I had my eye on a particular chair at the local department store. It was small, fairly light and by far the most comfortable thing I'd sat in since arriving in the country, including the leather sofas on the second floor of the home furnishing store. I know comfy chairs when I see them. The problem being that the chair in question was green, and the last one they had. It was actually one of the few greens I kind of like, a subdued limey colour. However, my living room contained 438576 shades of pink. So, I held off for a long while, probably two months, before finally I said "well, fine," and went to go buy the chair, rent a movie and sack out on my tatami rug for the rest of the evening. When I got to the department store, though - FOILED. The green chair had been sold. I hailed an employee and strung together a very ugly sentence that, translated, amounted to something like, "over there...green chair...last week...do you have?" She got the picture though and said it was gone, sorry. So I tried "more store...somewhere in Osaka...is there?" How she figured out what I meant, I'll never know, but she brought out a store listing and told me that there was a branch of their store in Kyoto and one in Ibaraki. Well, someone on the JET Facebook group had said that her town, Ibaraki, was "a stone's throw" away from mine so I Google Mapped it up. At the 3rd or 4th zoom level, my apartment was on one side of the screen and the store was on the other. I couldn't calculate biking distance for some reason. It was far, yeah, but I figured I could do it, or rather, had to, as now I had to have that chair. It was on, now. So the next afternoon I set out for adventure. 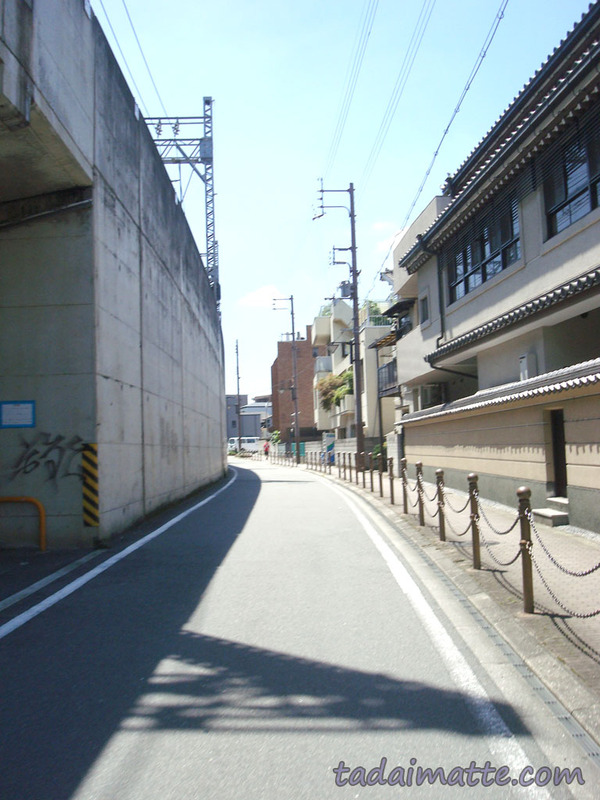 I biked alongside the river and through a million back roads, cursing Ibaraki for having little or no sidewalk. The beginning of the city was all rice paddies and overgrown fields, until eventually I hit pachinko parlours. After about 45 minutes I stopped at a Lawson to make sure I was actually going the right way. With all the stops, the trip was roughly an hour and a half. Fortunately for me, the department store had the chair in stock in many colours. Unfortunately, it was a full 2,000 yen more expensive than the one at the other store!? Well, I'd come more than ten kilometres for the thing and I wasn't leaving without it. 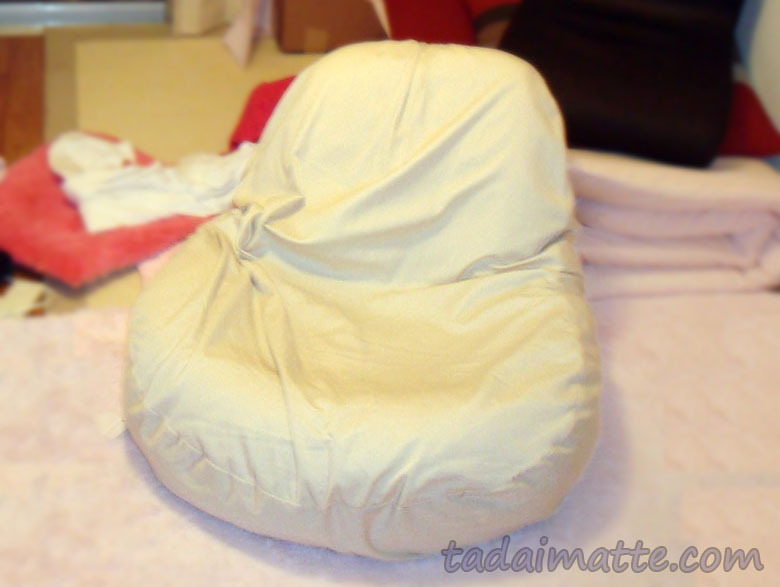 (Technically I did leave without it, though; I paid them 400 yen to deliver it to my apartment on Monday after school! It was a little bigger than I remembered.) Since my bicycle basket was empty still, I got a duvet from Muji, two fluffy floor cushions a few other small things. Around five, I headed back out and strapped my purchases to my bicycle. The ride home was actually rougher; this time I was on the opposite side of the street in order to move with the traffic during those times that the sidewalks randomly DISAPPEARED. Unfortunately, during one of those times, I hit a pothole that could have given someone whiplash at the right angle. All seemed well, until about two minutes later when my tire started making rubbery noises. There'd been a gas station about fifty metres back, so after confirming that my tire was indeed flat as a pancake, I walked my bicycle back to it and had them put more air in. The guy there said that I should take my bike to a jitenshaya-san (lit. "Mr. Bike," meaning a shop) to have it checked. I said OK and started keeping a close eye on the stores as I passed them, watching for jitenshaya-sans and gas stations, just in case, as well as bus stops. I'd seen buses pass me multiple times. Five minutes later the tire was flat again. I was near a bus stop so I attempted to board the next one after explaining that my bicycle was "broken" and I needed to get it back home. Unfortunately, the driver would not allow me to take it on the bus. I had a panic moment - it was now quite dark and I was rougly halfway back, with an irritating rice paddy/barren field combo still lying between myself and home. Stepped back off the bus frustrated and thinking about how guilty that guy was going to feel if I got hit by a car or murdered on the way back. Not that there's much danger of that in this country, but I do worry when stranded in the middle of nowhere! That'll teach me to try to save money.